Navigazione: Home | Range of P.D.O. Cheeses | Pecorino Siciliano P.D.O. This Pecorino from Sicily is a semi-cooked paste cheese made with whole, raw milk coming only from the Pinzirita, Valle del Belice, Comisana indigenous breed of sheep and their cross-breeds. The milk used to make Pecorino Siciliano P.D.O. must come from one or two milkings in a row at the most, usually the evening and morning milking. The milk must be processed within 24 hours after milking at the latest. The milk to be turned into Pecorino Siciliano must come from breeds that mainly feed on pastures. 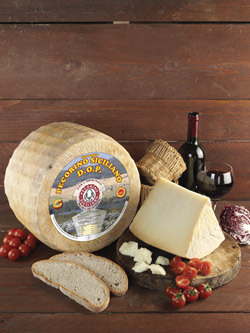 Pecorino Siciliano was awarded the Protected Designation of Origin status (D.O.P.) (EEC Reg. 1107 – 12/06/1996). History of Pecorino siciliano P.D.O. Pecorino Siciliano is the only produce among the typical products of our Island with the most evocative history of the Old Continent. 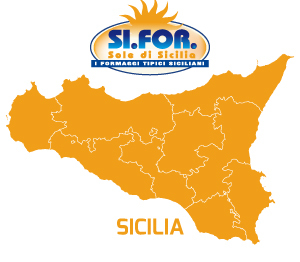 It shared the same history and path as the main food coming from the Middle East towards Europe, passing through Sicily and going on, after the First Punic War – to Rome and the territories of the Empire. The journey of Pecorino in Sicily starts with the arrival of the first sheep on the island aboard rafts. Once the animals landed, the sheep-farming started in the same areas as it is still present together with Pecorino Siciliano. Today’s Pecorino Siciliano is not different from the one made 1,000 years ago: in fact, the reasons that originated it are not changed as well as the manufacturing processes and pastures where the flocks feed on. It is maybe the most ancient cheese made in Sicily. The historic quotes date back to the IX century BC in one of the most known passages in the Odyssey by Homer, when Ulysses meets Polyphemus. Later on, even Aristotle and Pliny dwell upon the method to process this type of cheese. In particular, Pliny in his work “Naturalis Historia” writes a cheese list where the pecorini from Agrigento are quoted among the best ones. Each Pecorino Siciliano P.D.O. wheel is given a mark of origin and later a following selection mark. The former is a cheese-mould embossing the words “Pecorino Siciliano” on the cheese surface as well as the identifying number of the Dairy and the date of production. After a period of 4 months ageing, only the selected cheeses are branded by the certifying body stamping the words “Pecorino Siciliano”, which attest the requirements provided for by the manufacturing standard. All the cheeses bear an identifying number (which is stamped).